Get your little ones to recognize the different parts of speech as they read. 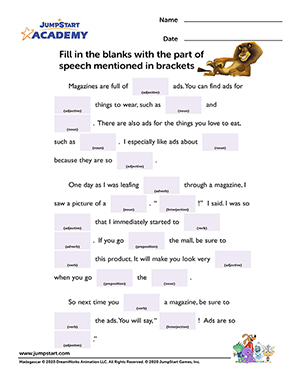 Help them skim through newspapers and magazines to find words that can be used to fill up the blanks in this worksheet. The part of speech to look out for is indicated in the bracket. Cut out words that will help make sense of the entire paragraph in this fun and printable worksheet.